Keep track of where your money is going with HomeBank, the eighth in our series on open source tools that will make you more productive in 2019. There seems to be a mad rush at the beginning of every year to find ways to be more productive. New Year's resolutions, the itch to start the year off right, and of course, an "out with the old, in with the new" attitude all contribute to this. And the usual round of recommendations is heavily biased towards closed source and proprietary software. It doesn't have to be that way. Here's the eighth of my picks for 19 new (or new-to-you) open source tools to help you be more productive in 2019. Managing my finances can be really stressful. I don't look at my bank balance every day and sometimes have trouble keeping track of where my money is going. I often spend more time managing my finances than I need to, digging into accounts and payment histories to figure out where my money went. Knowing my finances are OK helps keep me calm and allows me to focus on other things. HomeBank is a personal finance desktop application that helps decrease this type of stress by making it fairly easy to keep track of your finances. 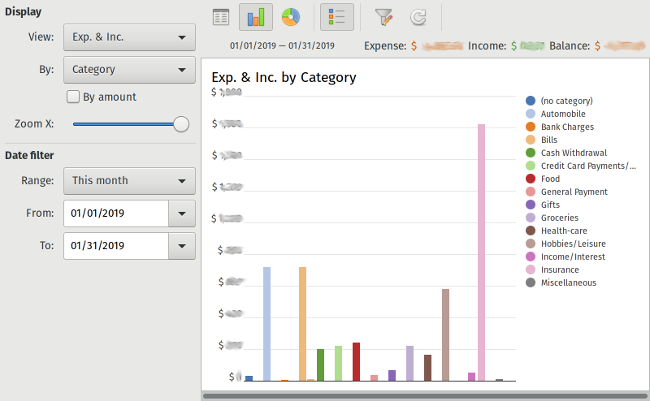 It has some nice reports to help you figure out where you're spending your money, allows you to set up rules for importing transactions, and supports most modern formats. HomeBank is available on most distributions by default, so installation is very easy. When you start it up for the first time, it will walk you through setup and allow you to create an account. From there, you can either import one of the supported file formats or start entering transactions. The transaction register itself is just that—a list of transactions. Unlike some other apps, you don't have to learn double-entry bookkeeping to use HomeBank. Importing files from your bank is handled with another step-by-step wizard, with options to create a new account or populate an existing one. Importing into a new account saves a little time since you don't have to pre-create all the accounts before starting the import. 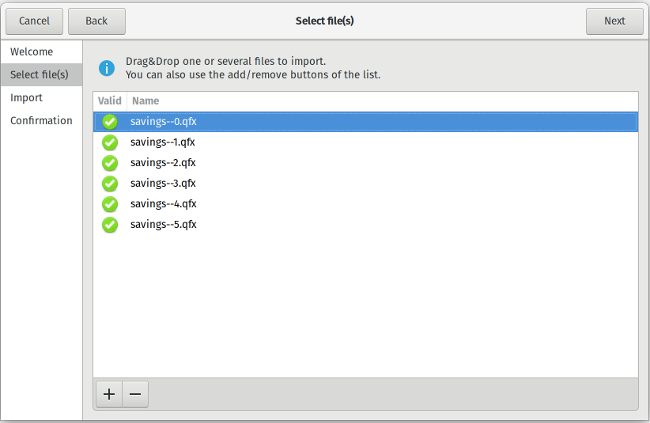 You can also import multiple files into an account at once, so you don't need to repeat the same steps for every file in every account. The one pain point I've had with importing and managing accounts is category assignment. Categories are what allow you to break down your spending and see what you are spending money on, in general terms. HomeBank, unlike commercial services (and some commercial programs), requires you to manually set up all the assignments. 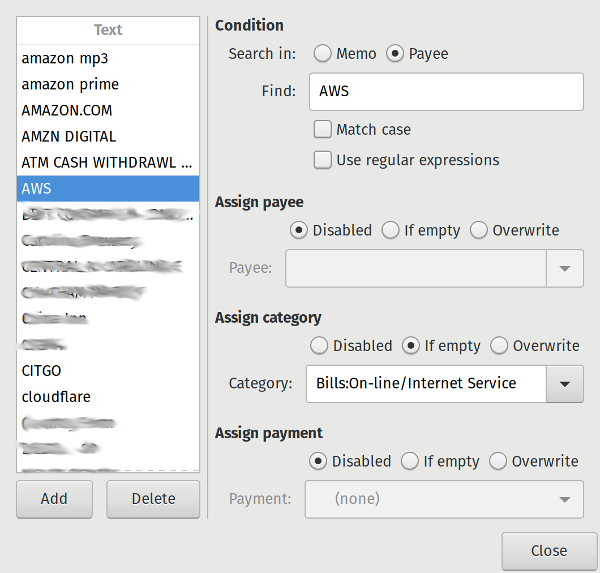 But this is generally a one-time thing, and then the categories can be auto-applied as transactions are added/imported. There is also a button to analyze the account and auto-apply things that already exist, which speeds up categorizing a large import (like I did the first time). HomeBank comes with a large number of categories you can start with, and you can add your own as well. HomeBank also has budgeting features, allowing you to plan for the months ahead. The big win, for me, is HomeBank's reports feature. Not only is there a chart on the main screen showing where you are spending your money, but there are a whole host of other reports you can look at. 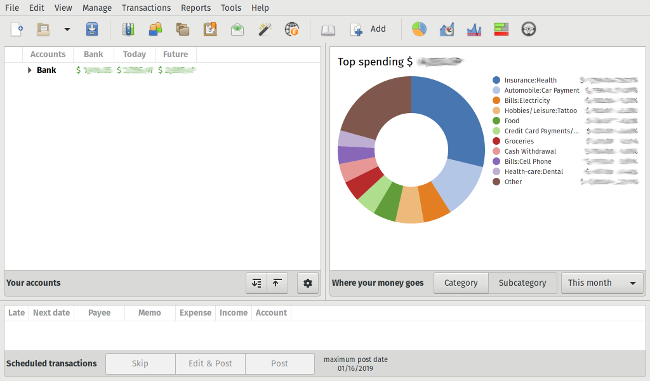 If you use the budget feature, there is a report that tracks your spending against your budget. You can also view those reports as pie and bar charts. There is also a trend report and a balance report, so you can look back and see changes or patterns over time. Overall, HomeBank is a very friendly, useful application to help you keep your finances in order. It is simple to use and really helpful if keeping track of your money is a major stress point in your life. Get help making hard choices with Roland, the seventh in our series on open source tools that will make you more productive in 2019. Just installed Homebank a few minutes before reading this article and so far so good! I'm using it in English, but I also like how you can use it in other languages. There is also an option to contribute to the software by translating in your own native language.